What can the U2+ do? 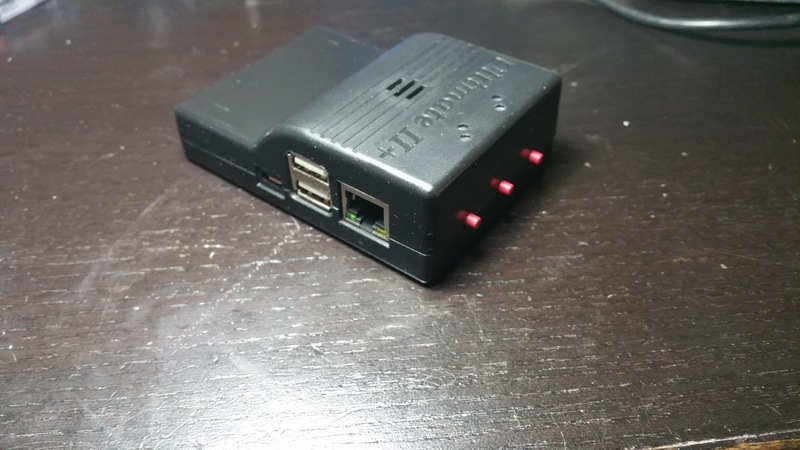 The basics is that it is a device that can run Commodore 64 cartridge images, run disk images by emulating a 1541 Disk Drive and run cassette tape images by emulating a 1530 Datasette, It plugs into the cartridge port on the back of a C64 or C128 and comes with a cable to connect to the IEC serial port for disk drives. There is an additional but optional cable that plugs into the datasette port. Since I have an NTSC C64, I do not need a datasette cable because precious little software was released for on cassette in NTSC countries. For PAL counties, adding the datasette cable is a no-brainer. The U2+ stores files and images on a USB drive. A USB stick can provide an enormous amount of storage, up to 32GB, for images. Each U2+ comes with an 8GB USB stick is formatted with FAT32. The U2+ can support subfolders, but on a C64 you only have a 40-column text mode, so take care that your filenames are not so long that you cannot distinguish them. The U2+ will sort files alphabetically. You can use your own USB stick provided it is formatted with FAT16 or FAT32. There is a Real Time Clock, powered by a CR2032, inside the U2+ for file date/timestamps. There are commands available to copy, delete or rename files. Physically, the U2+ is a busy device. It has LED lights on top of the unit, ports on the left and right side, slits for the internal speaker and three buttons on the back. The buttons, from left to right, are freeze, menu and reset. Unless you are trying to crack games, freeze is not likely to be useful to you. The reset button will perform a soft reset, most of the time. The menu button brings up the file menu for what is on the U2+'s USB drive. The LEDs on the left side of the cartridge are for the disk drive emulation, the right LEDs are for the cartridge emulation. On the left side of the cartridge (looking at the cartridge connector), you will see a port for the IEC serial cable, a port that looks like a blue USB 3.0 port and a green and blue audio mini-jack connector. 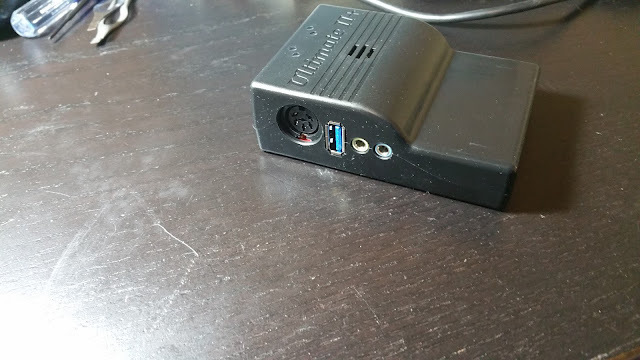 The blue USB port can work with non-USB 3.0 drives, but the extra signals provided by the USB 3.0 connector are used for the Datasette cable. It is best not to use this port except with the Datasette cable. The green audio output minijack can be used to listen to SID emulation from the U2+. This can be used to get sound support from a C64 with a broken SID chip or to provide support for a second SID chip. You could listen to drive sounds as well, which is very important in order to make sure that disks are still loading. Unfortunately there is a bug in the current firmware that the disk drive sound will sometimes not turn off when it should, resulting in a high pitched whine until the next disk load. The SID support is decent,but has issues with both complex, "4-voice" music as well as short or low volume notes. It is better than silence or broken SID audio. The red minijack is not presently used. On the right side of the cartridge, you have two USB 2.0 ports and an Ethernet jack. These USB ports are the ports you should use for your USB stick. The Ethernet jack's functionality is still rudimentary, you cannot use it yet to surf the 'net or hang out in an IRC channel You can use it to transfer files to the USB stick via FTP and also send commands to change disks via Telnet. From the menu, you can see the firmware revision at the top of the screen. The U2+ ships with firmware 3.0e, and it is not downgradable to the 1.x or 2.x firmwares for the older U and U2 cartridges. There is beta U2+ firmware as of this writing. When I tried to flash my U2+, it failed at first and the menu would not boot up. I feared I bricked the device but stumbled upon the Recovery menu by holding down the menu button as I turned the power on. This allowed me to flash the beta firmware properly. The menu can be navigated by the CSRS keys, but you need to hold the shift button to go up or left. Fortunately the menu can also be navigated by a joystick in Control Port 2. Pressing the enter button or the joystick button or CSRS right or the right joystick directional will enter a subfolder or bring up the file action menu. The action menu will be different depending on the type of file you are trying to run. Pressing CSRS left or left on the joystick will exit the menu or go up a folder level. F1 is Page Up and F7 is Page Down. F5 can be used to reset the printer emulation, each emulated drive and some other disk utilities. 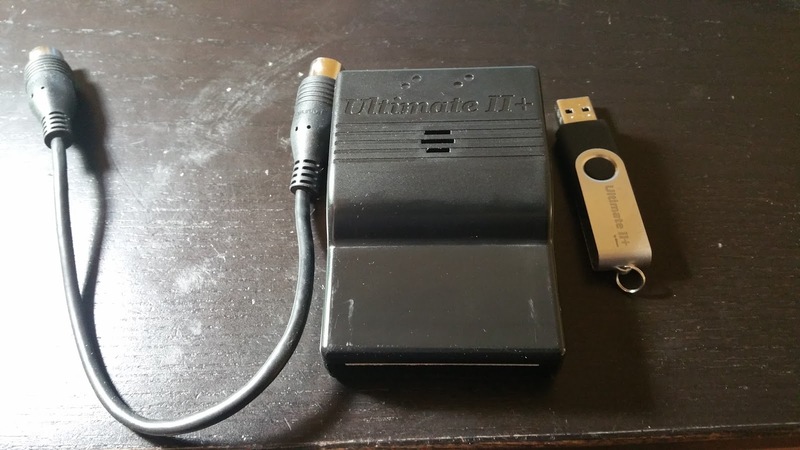 The U2+ can run .D64 and .G64 disk images, .T64 and .TAP cassette images, .CRT cartridge images, .PRG program files and .SID PSID music files. You can configure the U2+ by pressing F2 (Shift F1). This gives you several submenus to choose from. You can set the clock, configure the 1541 drives, change the settings for the built-in speaker, configure the virtual printer and select a helper cartridge. You press Run/Stop to confirm your choices and exit the configuration menu. I would have preferred using F1 or F3 to enter the menu and the ability to change more than one submenu's worth of settings at a time here. The Cartridge emulation of the U2+ is very straightforward. It can run small cartridges images like Donkey Kong or Wizard of Wor or large cartridges like Donkey Kong Jr or The Last Ninja. It also supports EasyFlash cartridges so you can run the excellent C64 conversion of Prince of Persia. Several disk games like Defender of the Crown and Maniac Mansion have been converted to EasyFlash for nearly instantaneous loading. The EasyFlash versions of Maniac Mansion, Zak McKracken, Deja Vu and The Uninvited add 1351 Mouse support like their IBM PC compatible counterparts. Fortunately both the simple cartridges and the larger EasyFlash cartridges use the CRT format. Not all EasyFlash conversions are NTSC compatible. PRG files are similar in that they are load programs loaded and run directly from the C64's memory, but they must obviously fit within the C64's 64KB of RAM. .T64 files are high level representations of cassette tape programs, while .TAP files are essentially raw representations of the pulses from a cassette tape. The latter are important for running copy protected programs. I have an NTSC C64 so the joys of datasette emulation are lost to me. The U2+ supports up to two 1541 Disk Drives, although by default only one is emulated. Not many games supported a second 1541 Disk Drive (Ultima IV & V are the only ones I know of). You can use a real 1541 and the U2+'s virtual 1541 to copy data onto real disks. With .D64 images, you shouldn't have many problems. But .D64 disks are just sector dumps and are only useful for cracked or never-disk protected games like the AD&D Gold Box games. In order to run most protected, uncracked games, you need .G64 images. Most .G64 images these days unofficially come from the C64 Preservation Project. There is a decent archive available on the internet. These disks were imaged using a Kyroflux or 1541 connected to a PC in a raw, GCR-format. The resulting format is a .NIB file, but unlike Apple II emulators, C64 emulators and the U2+ cannot deal with raw .NIB files. Instead, they have to be converted to .G64 files which give more information about how the data is formatted to the emulator. Sometimes the .G64 conversion in the archive just isn't correct to get the image running on a quality emulator like WinVICE. A good rule of thumb is that if the image does not work in WinVICE, forget about getting it to work with U2+. The U2+'s 1541 emulation is good, but not quite as good as WinVICE's. Every uncracked game you can get running with the U2+ will feel like a hard-earned victory. Make sure that if you are using an NTSC machine, that you get disk images that are not PAL exclusive. You may sometimes need to enter a command other than LOAD"*",8,1, so check documentation sites if you cannot find the right command to load a game. You may have trouble with .D64 games with crack intros, not because the game itself is problematic but because the cracker designed his intro to work correctly only on a PAL machine. One annoying feature of the menu is how it deals with .G64 images as compared to .D64 images. The first menu option when you select a .D64 image is Mount Disk, but the first menu option for .G64 images is Run Disk. Mount disk just loads or changes the active disk image for the emulated drive. Run Disk will load or change the disk image, do a reset and then enter the LOAD"*",8,1 command. Many C64 games require disk swapping, and it is easy to hit the button too quickly and select the default option for .G64 images. This will cause a reboot of the system. You can use the menu to read the file system of a D64 image but not a G64 image. The U2+ has a SID playback feature. You can download .SID files from the High Voltage SID Collection (PSID format) and play them back on your C64 with only the U2+. When you select the SID, the menu will allow you choose any song or the default song in that file. It will then display the information for the SID. You cannot simply use the joystick to choose another song, you must press the cartridge's middle button and select the SID file again to play a new song. Even though I have the less favored NTSC machine, there are still quite a few SID tunes that will play appropriately for an NTSC machine. Only the Skate or Die! intro played back too quickly through the built-in program. There are many, many more features to the U2+ than what I have talked about here, and more are planned. I wanted to give an overview of how the device works and what it can do. Naturally these functions are focused on what I find interesting about the C64 and its games. Although the U2+ is not cheap at € 149.95, those of us outside Europe will only pay € 123.93 (we don't pay VAT). At that price it is well-within the current market range for flash carts. While there are cheaper options available like the sd2iec, they do not emulate .G64 images, so you will be stuck with cracked games for the most part. The official Easy Flash carts are cheaper as well, but they require games to have been converted to the Easy Flash format.